If you dream of clean, clear pores, Face of Jules can deliver thanks to our use of a skin spatula. With this innovative device, we can quickly and effectively clear your pores and exfoliate your face while also preparing it for moisturizers and serums. The skin spatula is an innovative, compact ultrasonic skin scrubber designed to clear and smooth skin while improving the effectiveness of facial treatments. A focused eye treatment can work wonders for the sensitive skin around your eyes. Here are just a few of the ways our eye treatments can work for you. Increase in moisture. Anyone who regularly applies an eye cream knows the benefits of keeping your fragile eye skin moisturized. The problem is that, because this skin is so fragile, simply slathering it with just any moisturizer could actually do more harm than good. At Face of Jules, we can help pinpoint what your specific skin needs and tailor your eye treatments accordingly. We’ll choose a moisturizing treatment that will penetrate deeply and give you healthier, younger looking skin around your eyes. Diminished fine lines. The eye area is not forgiving. Crow’s feet are often some of the earliest wrinkles to form because the skin around the eyes is so sensitive. Couple that with the fact that many of us wear eye makeup – which requires some pulling and tugging to apply and remove – and it’s no surprise we often see fine lines developing early around the eyes. Getting regular eye treatments can help slow the aging process. Our targeted eye treatments can help diminish the appearance of existing fine lines and wrinkles and prevent new ones from forming. Improved texture and tone. The skin around and under your eyes is the first to show when you’re tired. Delivering the right nutrients to this high-maintenance part of your face can make it more resilient so that a single night of bad sleep doesn’t leave you looking haggard. Our eye treatments will leave your eye area looking bright and firm. Damage prevention. As we’ve said, the skin around your eyes is some of the most sensitive on your entire body. It’s susceptible to fine lines, bagging, and discoloration. Giving it the moisture and nourishment it needs to stay healthy can help you prevent damage and fend off aging. This fragile area needs protection. Our eye treatments give it exactly that. You deserve to look your best. Don’t let sensitive eye skin keep you from feeling great. 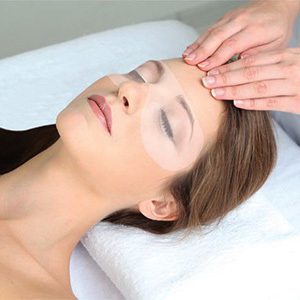 Revitalize the tired skin around your eyes with eye treatments. At Face of Jules, we can help you give life back to the skin that’s quickest to sell you out for being tired or even just aging. Our eye treatments moisturize and nourish your skin, helping it looks its best so you can look yours. Don’t delay in getting your eyes the care and attention they need.